When you are involved in a vehicle crash with an eighteen wheeler, the consequences can be catastrophic. Since most eighteen wheeler trucks are eighty thousand pounds or more when they’re carrying a big load, you can sustain severe injuries and damage to your vehicle very quickly. Some people don’t even survive the scene of the trucking accident, but if you are lucky enough to do so, your life is probably forever different simply due to the severe injuries you have sustained. It is not uncommon to suffer brain, head, back, or internal injuries that make it impossible for you to ever return to work. If this describes your case, a meeting with a Boca Raton trucking accident attorney should be your next step. A claim for compensation may be the only way to ensure that you get the medical care you need. You might not even realize the full range of your injuries until it is too late. For example, many head and brain injuries are not immediately noticed at the scene of the accident but the symptoms and the days and weeks afterwards can show that you have a serious problem. It can be challenging to remember to gather details in the wake of a trucking accident in Florida, but you do have several options as far as investigating what caused the accident. 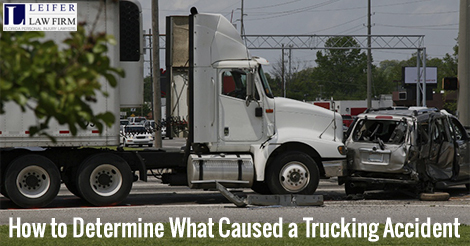 Unfortunately, there are many different reasons why a truck accident can happen. Follow the steps listed below in order to gather the most relevant information associated with your trucking accident in Florida. State and federal regulations mandate that certified truck inspectors look at any trailers and commercial trucks involved in an accident before it is taken from the scene of the incident. This report can show the condition of any mechanical parts linked to the trailer as well as the truck. Remember that these reports are not necessarily aligned with the local police report. You must contact the right government agency in order to determine this, and your Boca Raton trucking accident lawyer may be able to help you. If you are well enough to take pictures, or to have someone in your party document the scene of the accident, this can help to illustrate how the accident occurred. Pertinent details about how the car slammed into … how the truck slammed into something else can help to show the speed the vehicle was going as well as whether or not the driver was paying attention, for example. The trucking industry sometimes uses devices that are similar to an airplane black box that records all kinds of details like the pattern of speed, how fast the truck was going, and whether or not the driver used his or her brakes. It can even indicate how long the driver had been on the road at that time. Many of these devices are also common throughout the automotive industry, such as global positioning systems or onboard computers. The trucking industry also has its own version of high-tech devices know as inclinometers, devices that provide details about how to come around a corner safely and the angles of a slope. Getting any data from any high-tech equipment like this can be helpful for illustrating that an accident has happened. All trucks keep detailed information about the driver’s training, safety protocol and past accidents. Factors such as fatigue, distractions, the work environment, unfamiliarity with the road, lack of appropriate training, over the counter prescription drugs, speeding, and more all can contribute to driver error in trucking accidents. In fact, this is the reason why federal regulators have increased the number of rules associated with truck drivers, and are currently considering mandating that all truck drivers go through sleep apnea testing in order to prevent drowsy driving accidents. Consulting with your attorney after a city or trucking accident is strongly recommended so that you can protect your rights and move forward as soon as possible. Filing a trucking accident claim report may be the first step towards protecting you and your future.